Information and pictures of red flowers, like Geranium Collinum, Pannir Soppu,Primula Denticulata, Primrose, Drumstick Primula, Jalkutre, Thymus Linearis, Linear Leaved Thyme, Balma-jhar, Ban Ajwain,Indigofera Heterantha, Himalayan Indigo, Kathi, Kathoj, Sakina, Cypripedium Himalaicum, Himalayan Venus and many more found in Valley of Flowers. Flowering time June to August, You may find some flowers up to mid September also, near Pushpawati river bed. Where will you find it in Valley of Flowers You will find it in abundance in Valley of Flowers. Specially on the both side of trek after walking for just one kilometer from entry point. Other Information The word Atrisanguinea is derived from two words Atri means very dark and Sanguinea means blood red. You can observe these property in above picture. The flower looks so beautiful when you see it live in Valley of Flowers that you feel like touching it, eating it or keep watching it, specially due to its color and its velvet texture. Some Indian females also want to have a beautiful dress of this color. You go in any season to Valley of Flowers the probability of finding this beautiful flower is very high. Flowering time July to August. You may find some lonely flowering plants even in September near Pushpawati River Bed. Where will you find it in Valley of Flowers You will find it near to Pushpawati River bed. It is not so abundance as compared to his other counterpart Geranium wallichianum. Other Information The word Collinum is referring to hills- the habitat of the plant. Where will you find it in Valley of Flowers You will find it in early June near Valley of Flowers entry gate. Just after walking 150 meters inside you will find a frozen river. On its bank you can easily spot colonies of Primula Denticulata. Other Information The word Primula is derived from Primus means first, referring to flowers to that are first to open in spring season. It is used in treating diabetes and urinary diseases. Where will you find it in Valley of Flowers You will find Thymus Lineris among stones on your way inside Valley of Flowers. It is a mat forming herb which is strongly scented. It is responsible for beautiful pink patches in Valley of Flowers. Other Information The whole plant is used in the treatment of eye diseases, skin diseases and stomach ache. Where will you find it in Valley of Flowers You can find it on the way between Govindghat and Ghangaria. As it grows between 1500 meter and 3000 meter. Other Information Flowers are used as vegetable and leaves are used in alleviating dysentery and cough. 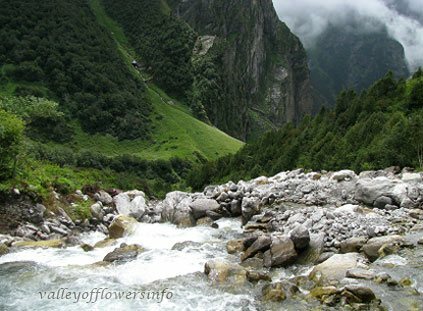 Where will you find it in Valley of Flowers You can find it easily near Pushpawati river bed in Valley of Flowers. 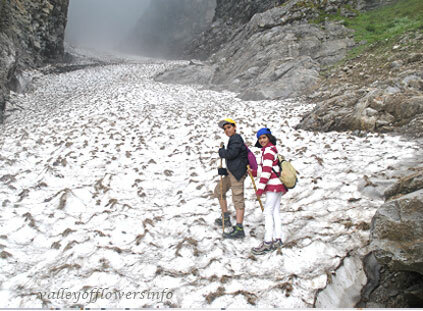 However many colonies of Bistorta Affinis can be seen on the bank of Hemkund Sahib lake also. Other Information The whole plant is used in treatment of cold and diarrhoea. Where will you find it in Valley of Flowers This is a rare flower found in Valley of Flowers. Although the flowering time is June to August, you can find it from July first to third week of July in Valley of Flowers after some effort only. Provided you know the exact location of the flower. This is so rare that you need some guide who knows about its location. You may find it just before crossing the wooden bridge next to the official starting point of Valley of Flowers, you can see small colonies of Cypripedium Himalaicum on your left side. You need to walk on your left few yards (Away from the main path), it is not available right on the way. Other Information This is a vary rare flower. You should visit Valley of Flowers in first or second week of July to have an opportunity to see this rare and very beautiful flower. Where will you find it in Valley of Flowers You can find Dactylorhiza Hatagirea easily in Valley of Flowers at its slopes. It is easily identifiable. However you should visit from July to mid August to find it easily. Other Information You can find Dactylorhiza Hatagirea easily in Valley of Flowers at its slopes. It is easily identifiable. However you should visit from July to mid August to find it easily. Where will you find it in Valley of Flowers You can easily see this flower on the bank of flowing water streams. Especially more you go deep into Valley of Flowers the chances of getting its large colonies are more. It gives Pushpawati river bed its pink shade in the month of July. If you want to see this flower in abundance you need to to Valley of Flowers from 15th July to 15th August and reach at least up to Pushpawati River Bed. Epilobium Laxum is other member of the family found in Valley of Flowers. Other Information It is used as an antidote to poisons and treatment of fever. Where will you find it in Valley of Flowers You can spot it in various part of Valley of Flowers. However you need to be there in July to mid August to spot it easily. It grows more in later half part of Valley of Flowers, near the Pushpawati River Bed. Other Information The word Porrecta is derived from word Porrectus means extended horizontally. Referring to the upper part of the flower. Where will you find it in Valley of Flowers You can spot it in various part of Valley of Flowers. It grows more in later half part of Valley of Flowers, near the Pushpawati River Bed. Other Information The word Heterodonta means Variably toothed, as you can see in the leaves. Where will you find it in Valley of Flowers You can find it easily just after entering the Valley of Flowers gate. In fact after checking in to Valley of Flowers this would be among the first to be seen. Many flowers can be seen if you visit till August mid. You can again see some of them near to Pushpawati river bed after crossing Bhojpatra Jungle. In September you can see beautiful buds of the flowers (After all the petals fell ). Other Information There are two different colored Rosa are found in Valley of Flowers, white and pink. Where will you find it in Valley of Flowers You can find this tiny flower on Pushpawati river bed in Valley of Flowers and on the bank of Hemkund Sahib lake. Please note that the flowers are too tiny to recognize. Even smaller than they appear in the above image. But they are really beautiful. Other Information Aleris means meal looking and Pauciflora means few flowered. Where will you find it in Valley of Flowers The flower is not seen in Valley of Flowers. 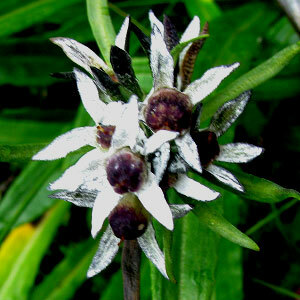 This flower can be easily seen in Badrinath and Mana village. In Mana village you can see near vehicle parking on the bank of river Alaknanda, very easily in the month of July and August. After August the plant matures and dies. This is a very poisonous plant. Other Information This is a very poisonous plant, in fact all parts of the plants are highly toxic and can cause convulsions, vision loss and even death. Where will you find it in Valley of Flowers You can see this flower right from the entry gate of Valley of flowers and till the Pushpawati river bed at various spots. The flower can be spotted easily because of its color and size. 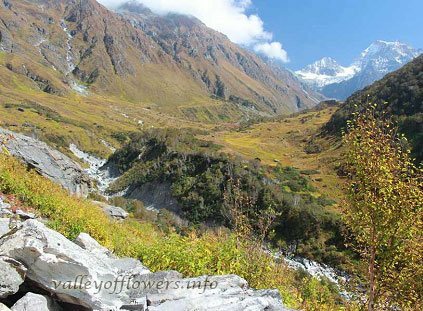 If you visit Valley of Flowers after second week of August you will find only a few flowers blooming but you can witness the tall stalk of old flowers which bloomed in July and August. 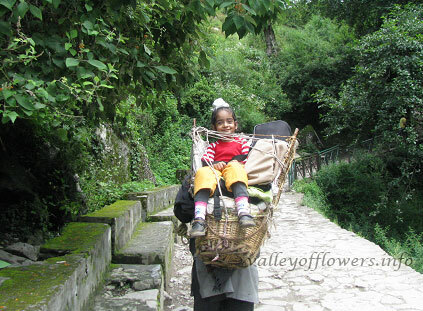 The picture above was taken on 15th July, 2007 just after entering the Valley of Flowers gate. You may see village Ghangaria in background. Other Information The flower is named after a French nurseryman Louis Morin, who produced the world's first plant catalogue in 1621. Longifolia means long leaves. In Tibetan medicine stem, leaves and flowers are used in digestive disorders, nausea and vomiting. Where will you find it in Valley of Flowers You can find Rhododendron Lepidotum on a grassy slope just after crossing first river near the entry gate of Valley of Flowers. Soon after entering the gate and walking for just 100 meters you will have to cross a shallow / frozen river. After crossing this river you can see this flower on your right side slope. This flower can be seen till July end easily. Other Information The people of Manang district, central Nepals, take the juice of the plant, believing it purifies the blood. Pounded leaves are boiled in water and spread on cots, beds, and mats to kill bugs. Where will you find it in Valley of Flowers You can find it very easily in the dense forest at the entrance of Valley of Flowers and after crossing iron bridge over Pushpawati river (500 meters from entrance). This flower looks very beautiful when it swings even in slightest of breeze. Other Information The word Thalictrum is derived from word Thalictron which means plant with divided leaves. Where will you find it in Valley of Flowers We have never seen this flower in Valley of Flowers. 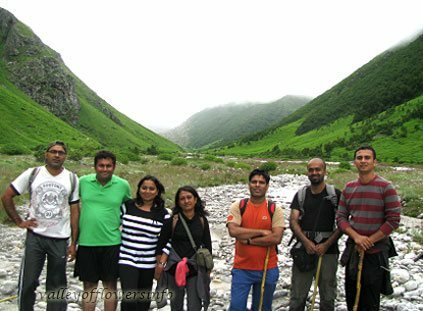 The above picture was clicked in open grassy slope of Auli (A beautiful hill station near Joshimath) in July 2007. Other Information The term Thyonium means Smoky or Dull, which can be seen in the color of the flower. Where will you find it in Valley of Flowers You can find this Perennial herb just after crossing the dense forest on your trek to Valley of Flowers from Ghangaria. (Just one and half kilometers from the entry gate of Valley of Flowers) You can find this herb on both sides of your narrow trek. Other Information In Italy the young shoots are eaten, usually boiled briefly in herb infused water, and then cooked with eggs and cheese. In Friuli it is one of the ingredients in the local home-made soup based on wild greens called 'pistic'. Where will you find it in Valley of Flowers You can find Colquhounia Coccinea or Himalayan Mint Shrub very easily on your way from Govindghat to Ghangaria. If you are going by pony you will find that ponies love to eat the leaves of this plant. Other Information Named in honor of Sir Robert Colquhoun, who was a lieutenant in British army in India and a plant collector and early patron of botanical gardens of Calcutta. 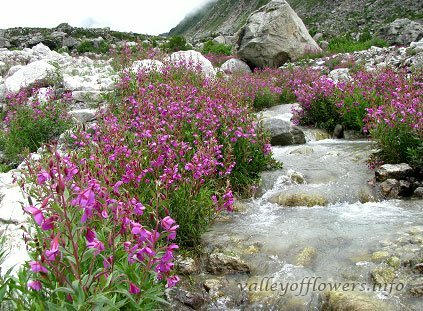 Where will you find it in Valley of Flowers You can find Epilobium Laxum very easily in the middle part of Valley of Flowers, specifically near water streams. You can see this little flower on your trek after entering Valley of Flowers gate and trekking for just one and half kilometers from July to September. The flowers resembles its family member Epilobium Latifolium which are found in abundance on Pushpawati River Bed, so much so that it paints the river bed in pink shade. Other Information The word Laxum means growing loosely. Where will you find it in Valley of Flowers You can find this on the left side of the trek just after crossing the dense forest 150 meters from the entrance gate. Just after crossing the dense forest and seeing a hollow tree (on your right) your trek will decend to iron bridge over Pushpawati river and you can find Fragaria Nubicola on your right side along with Blue poppies and Primula radii among rocks. Other Information Fruits are very tasty and edible. But please don't pluck them from Valley of Flowers as they contains seeds which are important for next season. 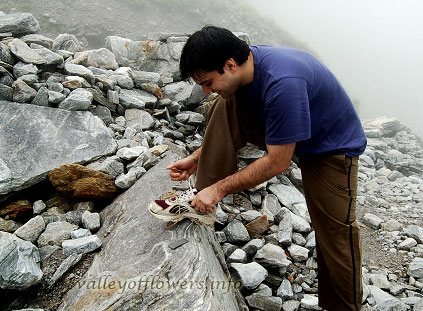 Moreover plucking anything from Valley of Flowers is a crime under Indian laws. Where will you find it in Valley of Flowers This flower is found in abundance in Valley of Flowers. It is found in so much quantity that it paints the Valley of Flowers in pink shade during the later half of July and first half of August. You can see this flower right from the entry gate till Pushpawati river bed. But you can see the biggest colony of the flower just before reaching at official starting point of Valley of Flowers. The official starting point is three kilomneters from the entry gate. Other Information The seeds of the plant are edible. Where will you find it in Valley of Flowers You can find Oxyria Digyna easily on Pushpawati river bed. In fact this picture was also taken at Pushpawati River bed. This flower is found at an altitude of 2400 to 5500 meters. You may also find this flower near Hemkund Sahib lake. Other Information The word Oxys in Greek means sharp or sour, referring to the sharp or bitter taste. The whole plant is used as an appetizer. The leaves are rich in Vitamin-C.
Where will you find it in Valley of Flowers Generally this flower is found on the way from Govindghat to Ghangaria and this flower is not found in Valley of Flowers. This picture was clicked near village Bhuandar. Other Information Leaves of this plant are used in treatment of wounds. Whole plant is believed cause abortion. Where will you find it in Valley of Flowers This flower is found on the way from Govindghat to Ghangaria. Just after walk in few hundred meters from Govindghat you may see this flower near your trek. We have not seen this flower in Valley of Flowers. However, this flower exists in wide altitude range of 100-4800 m.
Other Information The plant is used as an antidote to Snake poison. 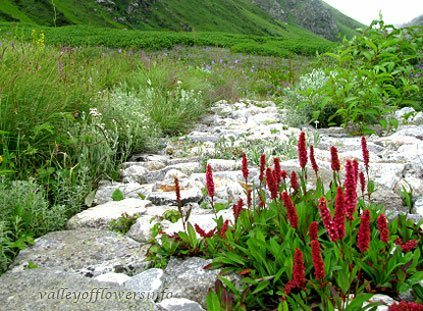 Where will you find it in Valley of Flowers Rhodiola Wallichiana is found on the Bank of Hemkund Lake and in the deeper part of Valley of Flowers. Generally you may not find this flower easily in Valley of Flowers but you can easily spot it at Hemkund Sahib Lake. There you can find this flower along with colonies of Saussurea Obvallata (in July, August & September), Blue Poppies (in July and August) and Aconitum Violaceum (in September). Where will you find it in Valley of Flowers You can find this flower after trekking for 1-2 Km. from the entry gate of Valley of Flowers. This plant is found an altitude range of 2100-4100 m. This is a rare plant. Other Information In Greek Gracile means graceful and Florus means flower referring to graceful looking flowers of this species. Where will you find it in Valley of Flowers This flowers is a bit rare flower to spot in Valley of Flowers. Last year we could spot only 2 flowers of Allium Wallichii. You can spot it in the middle part of Valley of Flowers. Middle part means after trekking 3-4 Km. from the entry gate of Valley of Flowers. Other Information This plant is found at an altitude range of 2800-4300 m. Bulbs of this plant are used in treatment of altitude sickness and cough. Flowers are used for garnishing salads. Where will you find it in Valley of Flowers This flower is found easily in the later half of Valley of Flowers. Bees love this flower and you can spot hundreds of Bees on these flowers if you can spot its colony. This plant grows in colonies near streams and wet places generally on rocks. Other Information This flower found an altitude of 2000-3500 m.
Other Information Leaf paste of Leycesteria Formosa is used in treating Dandruff and killing lice. The word Formosa means finally found or beautiful referring to flowers of this species which very attractive. Where will you find it in Valley of Flowers You can find this flower after crossing first river near the entry gate of Valley of Flowers. Just after crossing the river on the mountain slop next to it you can find Spiranthes Sinensis specially in the month of September. Other Information This flower is found at an altitude range of 2800-3300 m. The whole plant is used in treatment of fever. Where will you find it in Valley of Flowers You can find Vigna Vexillata on the way from Govindghat to Ghangaria. As this flower is found at an altitude range of 1200-2200 m. it is not found in Valley of Flowers. Other Information Routes are edible, seeds are used as vegetable and whole is used as a fodder. Very nice collection of flowers. Nicely presented. I would like to go to Valley of Flowers in 2013. Have you fixed your departures of 2013. I will be coming form New Delhi. What will be the cost. kindly send me all the information in detail. Will you provide me a guide for the trek. 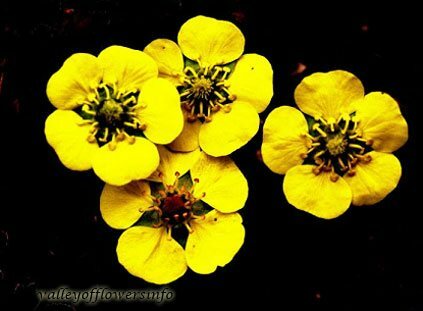 The flowers are beautiful, especially Vajardanti, Potentilla Atrisanguinea is my favorite. The fixed departures to Valley of Flowers have already been announced. To know the dates kindly click here.I accompany my groups to Valley of Flowers. I will be personally coming with all the groups at least ion the day we will be going to Valley of Flowers. beautiful presentation. nature at its best! 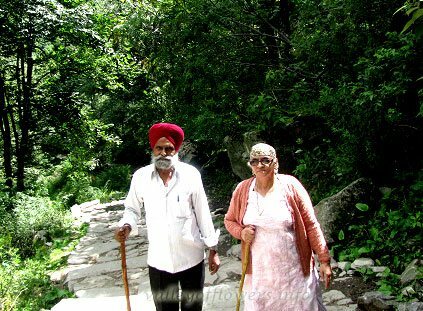 my wife(44yrs)and self(53yrs)would like to join your group leaving haridwar on july 27th, 2014. will this the best time or you suggest 1st wk of aug 2014? i have gone thru the itinerary. Both the dates are similar and you will see lot of flowers during this time.